After a long break, Lev Tahor is back with their fifth album, and it’s already generating a lot of positive feedback for good reason . Lev Tahor, a singing group made up of Ari Cukier, Gadi Fuchs and Eli Schwebel, has long since been a prescence in the Jewish music scene with lots of hits and their four previous albums all being memorable and high quality. Although the music scene has changed quite a bit, Lev Tahor’s sound is timeless. It can almost be described as “easy listening”, with the music taking a back seat to the vocals and lyrics. 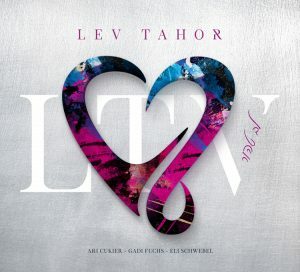 This album sounds fresh but still retains the classic Lev Tahor feel- modern but tasteful, signature vocals and harmonies, a good amount of English lyrics and songs, and the album itself having an inspirational and uplifting flavor. For lack of repeating my colleague One Week Later who posted about the album last week and gave a summary of the group, I will dive right into the songs. 1. Hallelu- What a fun song to start the album. Still relaxed and light, its upbeat and has a tropical sound with the percussion sounding African and a bit of almost chanting in the background at times. It’s incredibly catchy and one of my favorites. However, I think its very short for the leadoff track at just 3:09. It doesn’t come even close to sounding repetitive and boring, so I am not sure why they made it so short. 2. Lecha Dodi- A haunting ballad with a lot of powerful harmonies. I love the melody in this one and could definitely see it being sung in shul. It has an old school feel to it, and almost sounds familiar, but its definitely a new song. This is probably my favorite slow song on the album. 3. Gam Zu Letova- A mostly English song (the only Hebrew is “Gam Zu Letova”) with a message that you can guess. Another slight tropical feel here. I really appreciate how they manage their songs to be uptempo without overloading on intense guitar solos and techno bass. This song feels very contemporary and fresh, and I could see it doing very well in the kiruv circuit- universal message, doesn’t sound “too Jewish” (yet extremely tasteful and appropriate), and English lyrics. 4. Shoovi- This is another English song about returning to Yerushalayim and also manages to be relaxed but extremely catchy and up-tempo, and, again, feels very contemporary. I have always liked the English and Hebrew lyrics mixed together, and this is a good example of it. This song also does a good job of showcasing how the members of Lev Tahor use their voices in a smart an understated way. 5. Avdecha- This song does have a bit of a techno feel, and sort of reminds me of later Shalsheles with the big echoing drums and the vocals sounding almost far away. The chorus has a sweeping feel, with the tempo picking up in an unusual way and the melody overall is unique and interesting. 6. Simchas Beis Hashoeva- As this song features Lipa Shmeltzer, it has its own Lipa-esque feel to it and is a lot of fun. I would not think to blend together Lipa and Lev Tahor, but it works incredibly well and he sounds like a member of the group. I love collaborations like this because it challenges the artists to come together and when it works, its awesome. The track is very funky and unique and , I can’t use the word enough for this song, a lot of fun! 7. Birchas HaChodesh- After the party in the previous track we need to relax, so this next one is slow. It’s a delicate and simple melody that incorporates words that I have always loved in any song. The vocals here are particularly impressive, and they make it sound easy. 8. YAGGAPELLA- This song was originally on Eli Schwebel’s solo album, and here the other two members of Lev Tahor joining in. It’s a simple but fun acapella song, in the classic Lev Tahor style, and with English lyrics mixed in. The message is nice and not one you hear a lot in music about having the “pooooowerrr to choose your life !” and “a firrrrre burning through the night!” Very catchy song that you will be singing along to on the first listen! 9. Dror Yikra- What a great song! The melody and music feel sefardi, but the accent is Ashkenaz so I’ll take it as a blend. It’s simple enough for any of us to follow along with the melody easily, and I can definitely see a lot of families singing this on Shabbos. This is a hit! Just wow, excellent composition by Yehuda Gilden and excellent vocals all around. 10. Mr. Tanner- Cute song with a good message about doing what you love regardless of what everyone else thinks. It is more involved than a typical English song and well-written. 11. Don’t Stop Giving- Also originally on Eli Schwebel’s solo album (at least a version of it), this is a modern techno contemporary song. It’s definitely a high quality and tasteful song, but with the lyrics being all in English and the techno music, it doesn’t feel particularly Jewish. 12. Meheira- A very pretty chuppah-worthy meheira that stands out from the pack. It doesn’t sound like or remind me of any of the other millions of Meheiras we have heard. Very well done and an excellent song to end the album … excellent enough for us for listeners to want to start right back at track 1 and listen again! Thanks Eyal- I didn’t know that!